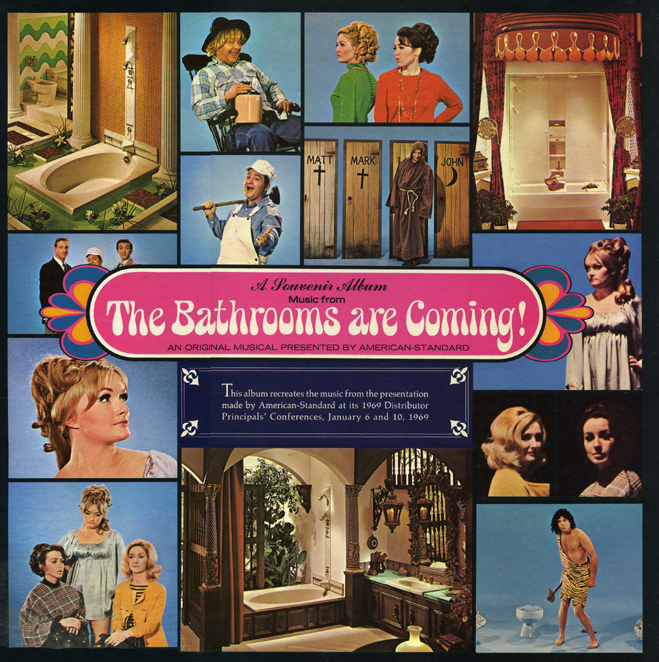 The Bathrooms are Coming premiered a new decade of bathroom fixtures born out of exhaustive human and product research by American-Standard. The story began with the introduction of a mythical Greek goddess Femma, the epitome of all women’s attitudes, reflections and desires and the leader of all women’s movements. In the play Femma is called upon by other women to start a bathroom revolution – "Join the fight for bathroom safety, Femma…the fight for beauty and luxury. We need freedom from bathroom oppression. Join the fight for better bathrooms." And so it was that Femma led the story. It began with a declaration that "plumbing" is a feminine business, shoring a profile of the "woman of the 70’s," and the case for change against the status quo, She carried the audience through the Cornell research, to a view of markets in terms of people. Then, the Revolution unfolded in terms of new attitudes, new programs. Then one by one, the real stars of the show were revealed – Economy Wall Surround, Proximatics, Ultra Bath, Bone and Spectra 70. 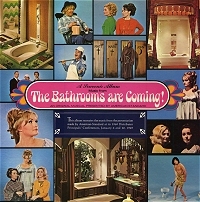 So, is the show a mockery of the then-current women’s movement, or is it simply an innocent take on bathroom fixtures? Does it matter? Mercifully, they left the dialogue off the record and kept only the musical highlights. In this case, the music and lyrics were written by Sid Siegel, who had a fruitful career in this business, writing entertaining musicals for Standard Oil’s Western Division, Encyclopedia Britannica, and Converters, Inc., a company that made disposable paper hospital garments. Go, Sid! Besides "My Bathroom" track, I believe the best songs are the ones that concentrate on the new fixtures, like "My Ultra Bath" and "Spectra 70." But as I mentioned, the whole thing is pretty good. It dates from 1969. A couple notes: yes, "Ultra Bath Dream" and "The Ultra Bath" are pretty much the same song – and I apologize for the 20 seconds or so of scratchiness on Track 7. I have tears of joy as I am writing this (OK, not really). I again have a copy of "My Bathroom (is a very special place)"! It had been deleted accidentally several months back, and now it's back in my collection, where it belongs. "Now at last I can really be me"! This is good but "Chevrolet Sings of Safe Driving and You" blows this away. A great, great album. The melody of "Look at This Tub" would have been right at home in an '60s Anthony Newley musical. Wonderful! I always wanted this ever since first seeing it mocked on Late Night with David Letterman courtesy Steve Young and "Dave's Record Collection." At last! The world will hear that "Proximatics" is the true hit track. I am glad you enjoy this album, and that you especially enjoy "My Bathroom" because my Mom is the singer on that track - and others. i love the song MY BATHROOM! The women singing is a very close friend of my family! We love her very much!! anyone tell me what label this music is on please? It is not on a label - it's a private pressing.